We grew fresh borlotti beans in our little garden last summer. The beans had a fabulous creamy texture. Serve this as a starter with lots of ciabatta to mop the plates with. Finocchiona is a soft salami from Tuscany with fennel seeds in it. Wine Suggestion: If you feel like a white choose a Vermentino from the Tuscan coast; we like the Poggio ai Ginepri Toscana Bianco. If red is what you feel like search out a fresh, youthful and fruit-driven Chianti like the Rocca delle Macie Chianti Vernaiolo, a real taste of spring and summer with no oak and vibrantly fresh fruit. Put the beans into a medium-sized saucepan with the garlic and cover with water. Bring the the boil, then simmer for 25 to 35 minutes or until tender. Drain, season generously, then add the vinegar & 3 tbsp of your best olive oil. Slice the plum tomatoes in half lengthwise, then cut each half into 3 long strips. 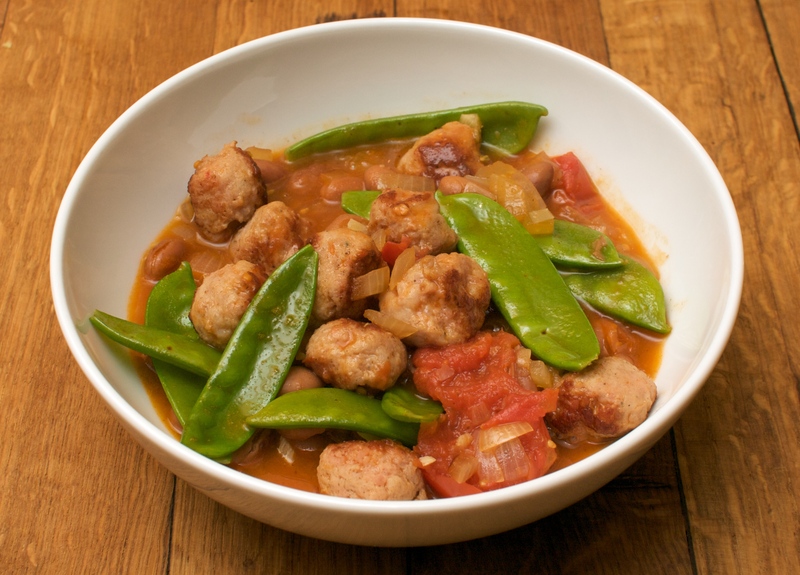 Season the tomatoes, then gently fold into the borlotti beans. Divide the beans between 4 plates and scatter the salami over the top. Serve drizzled with some more oil. This simple salad makes a tasty main meal. Heat a large frying pan and fry the bacon, without adding any extra oil, until brown and crispy. Remove from the pan and drain on kitchen paper. If there is a lot of fat pour some off but leave a tablespoon or so. Tear the bacon into bite-size pieces. Add the Sherry vinegar to the pan and let it bubble for a few seconds. scraping any crispy bits form the bottom of the pan with a wooden spoon. Add the beans and peppers and season, then stir gently until heated through. 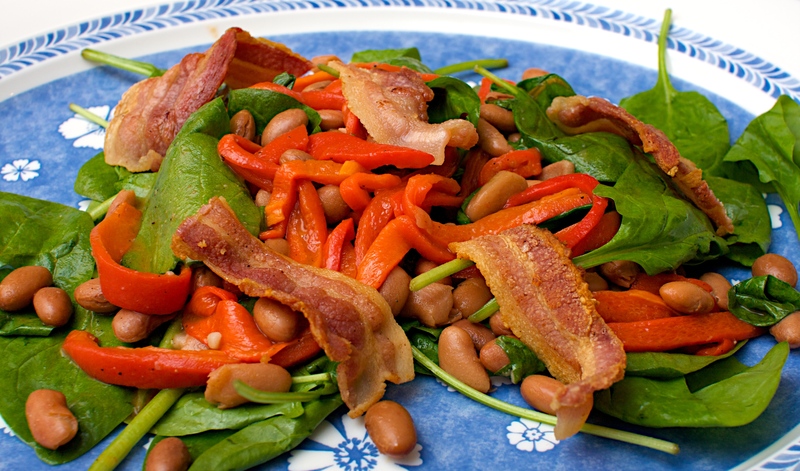 Take off the heat and stir through the spinach and bacon. Drink with: a nice dry but fruity rosé from Provence or a rosé made from Syrah from the northern Rhône.